This weekend iJoomla team released updates for Joomla LMS Extension: Guru 5.1.15. This release has major improvements in the payment section and Teachers section. Guru 5.1.15 comes with a new Payment plugin : Paypal Pro, certificate view for teachers with an improvement and 5 bug fixes. Guru introduced a new payment plugin for PayPal payments, Before Guru supports PayPal plugin that required users to have a PayPal account, Paypal Pro payment plugin allows to pay directly from the credit card without PayPal accounts, It will give a hassle-free buying experience. Strip payment plugin is updated for providing additional user details, So when user will pay using strip he needs to provide his name, addresses information, that makes the payments more secure. 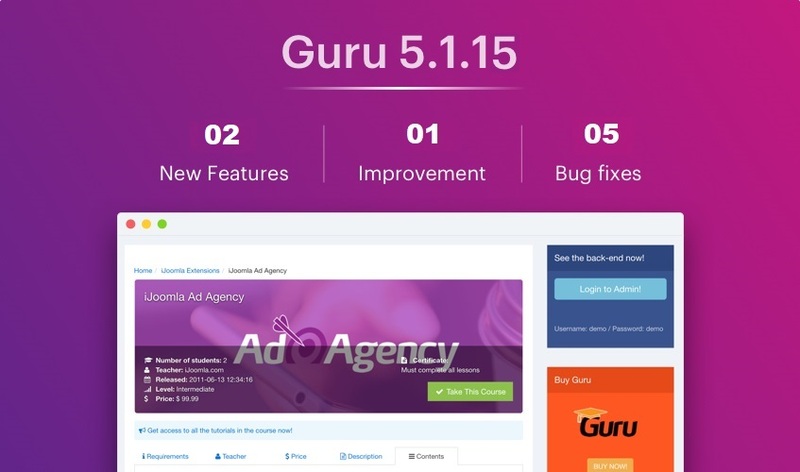 Guru LMS Joomla extension variety of features to give a complete LMS experience, in latest update we have added an additional tab for a teacher to see the student’s certificate reports. With this section, teachers can log in on frontned and view the students’ certificate reports.